Find out the best way to get here on this page. 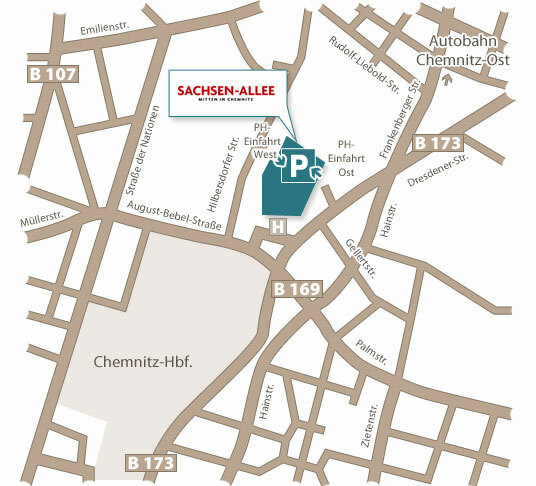 It’s easy to get to Sachsen-Allee by car. You can download a map with directions as a PDF file here. A total of 2,000 free parking spaces make shopping here more enjoyable. CVAG bus lines 82/51, 640/642, and 705/710 stop directly in front of Sachsen-Allee, and bus line 21 stops nearby. Or use the CVAG’s travel planner or personal schedule – the public transport authority transport authority offers a number of different options to help you plan your trip. Several bicycle racks are located directly at the Thomas-Mann-Platz entrance.